Once considered as a fancy food only available to a certain demographic, sushi has become ubiquitous today. From stands at the local malls to high-end restaurants, it can be found almost everywhere across the globe. While a lot of debate is going around on whether sushi is healthy or unhealthy, promoters of both sides commonly agree that its healthy quotient heavily depends on the ways it’s prepared. Unfortunately, the sushi people are getting today is far away from the sushi that was pioneered on Tokyo’s streets in the 1820s. However, there are some restaurants that offer a modern yet traditional approach to Japanese dining, Kyoto Sushi & Grill being a leading one among them. The team wanted to offer their patrons a memorable impression through some captivating wall graphics at their new location to keep interest growing and to increase foot traffic. Not only did they want to have an intricately detailed design but they also wanted their customers to know at a glance the food and beverages they offered. 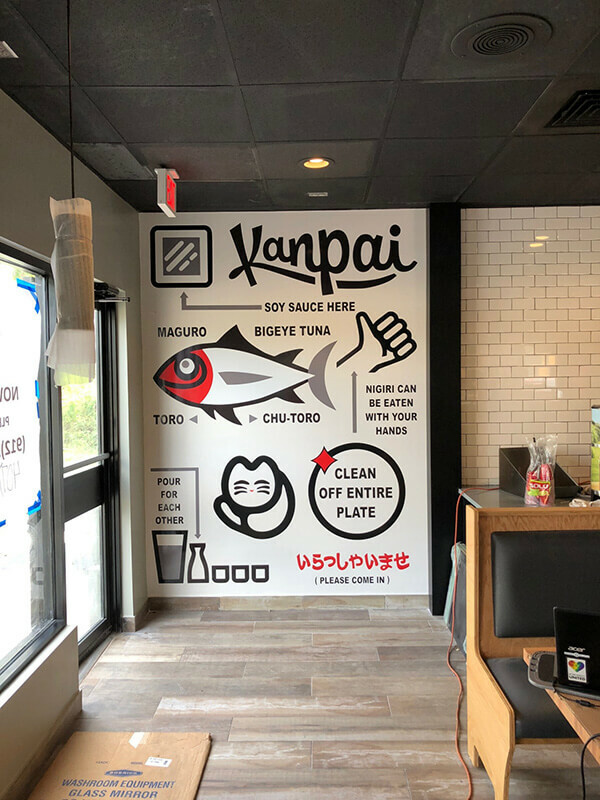 That was our brief from Kyoto Sushi & Grill when they were expanding to a new location and contacted us at Citrus Sign Studio to decorate their interiors with some wall graphics that would create a strong, positive first impression on their customers. Kyoto Sushi & Grill is one of those few restaurants that have been able to maintain the same quality and style that traditional Japanese restaurants offer. The family owned and operated business started its journey from the UCF campus and now has become one of the leading Japanese-style restaurants that cater to both on-the-go campus and off campus patrons. Prioritizing their customers’ dining experience the most, the brand has become synonymous with the highest quality, authentic Japanese cuisine at an extremely affordable price. Sushi, Hibachi Grill and Bento Boxes – all these cooking styles are served here to satiate the patrons’ taste buds. 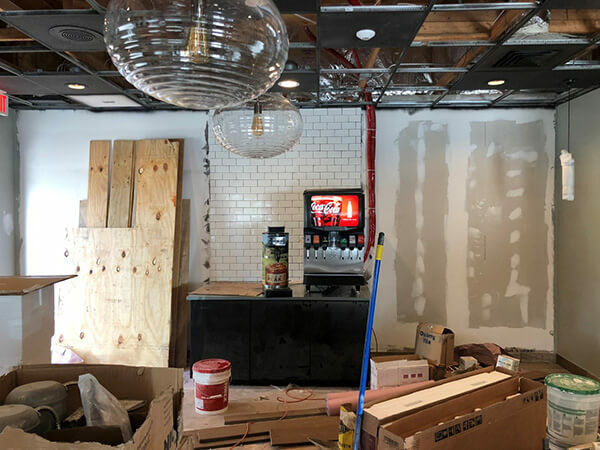 The team needed the wall graphics at their new location to be more vibrant and enticing while having a traditional touch at the same time, which would resonate with their mission to offer traditional cuisine, delivered in a contemporary style. 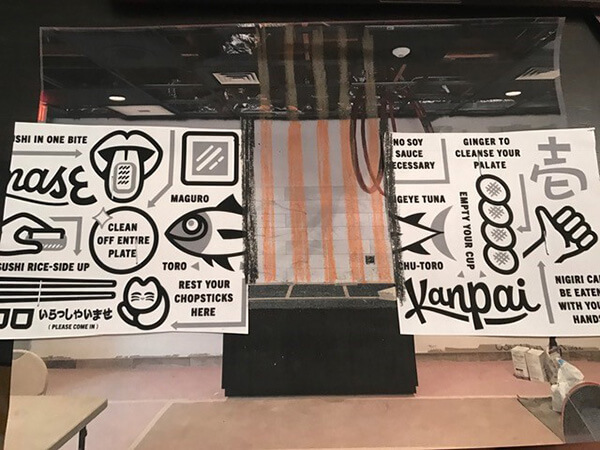 Kyoto Sushi & Grill was looking to have some creative wall graphics instead of wall arts filled with lots of colors to offer the patrons a modern and memorable dining experience. So, our team of designers arranged a meeting with the management team to obtain a clear idea of their vision and mission before starting with the process. After some brainstorming sessions, our team decided to start the entire process from scratch to attain the results desired by Kyoto Sushi & Grill. 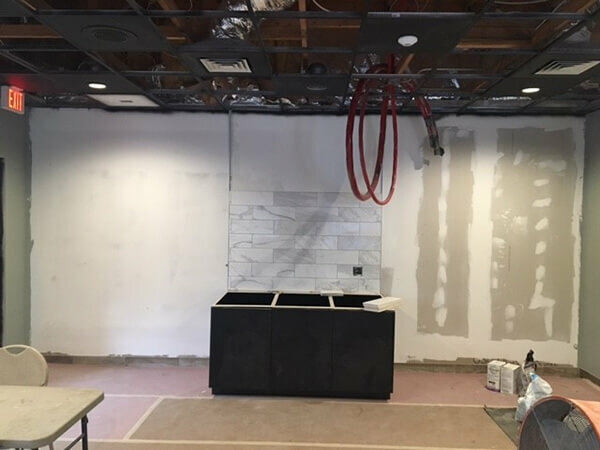 As it was a new location and we didn’t have anything to tweak, we took complete measurements of the walls where our client intended to have the wall graphics. We planned to prepare the wall graphics in such a manner that would accommodate both traditional as well as contemporary feel without causing any conflict or jarring contrast. So, we started with depiction of the traditional way of Japanese eating (much like an info-graphic way) and gradually moved onto adding some trendy buzzwords. 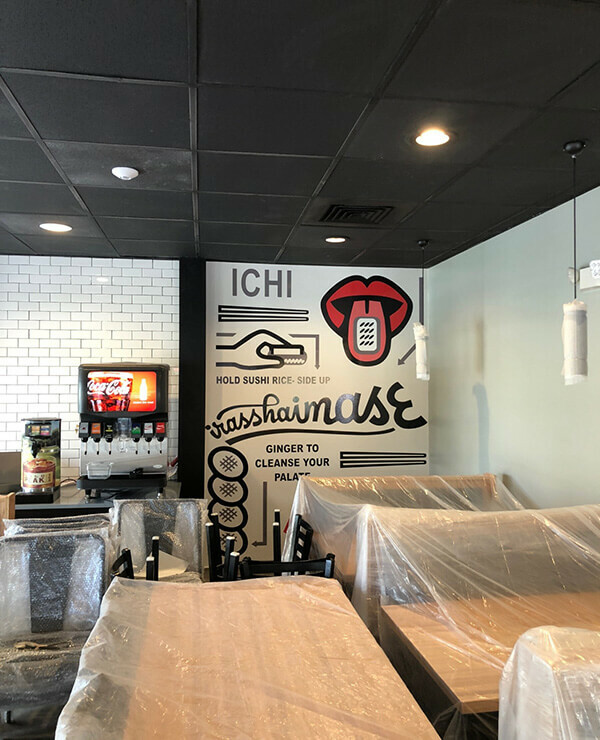 Once our adept designers were done with the wall graphics, it was our professional installers who put them up at the interior of Kyoto Sushi & Grill. With years of industry experience, our team of installers was highly aware of the perfect placements of the wall graphics that made them clearly visible across the restaurant while offering a merged feel of both contemporary and traditional dining styles – exactly what was needed by Kyoto Sushi & Grill to offer their patrons an amazing, long-lasting impression during their gastronomic journey.